According to the American Association of Retired Persons, 90 percent of older adults wish to age in place rather than move to a senior or assisted living facility. Even seniors who need assistance with activities of daily living may be able to age in place. However, doing so means finding a home with senior-accessible features that help keep you safe and happy. There are online resources that can help fine-tune your search for an accessible home. Here are a few tips to help you locate a senior-accessible property. An open, level floor plan is optimal for a senior, which makes ranch- and bungalow-style homes preferable to houses with lots of stairs and raised areas. Split-levels and homes with raised thresholds and uneven transitions between rooms can cause significant problems for older adults with mobility issues. Floor plans with posts and partial walls can make getting around problematic for a senior who relies on a wheelchair or walker to get around. Thick carpeting can also present a problem, so emphasize properties with smooth, level hardwood, tile or laminate flooring. Doorways may create an impediment for seniors who have trouble getting around. Doorways should be 32 inches wide and hallways 36 inches across to accommodate a wheelchair and make it easier for someone with a cane or walker. 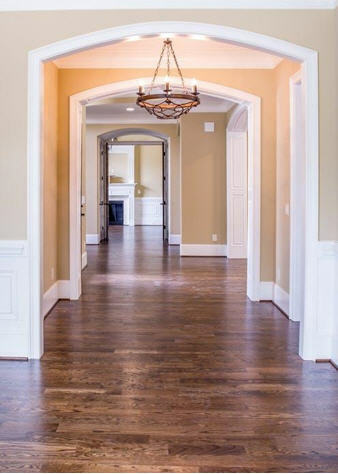 It may be necessary to make modifications if you choose to purchase a home with doors and hallways that are too narrow. Doors with expandable door hinges can improve access without having to pay for more extensive structural modifications. Pocket doors are also conducive to senior accessibility, because they simply recess into the wall. If you are in a wheelchair, a kitchen with lowered countertops is considerably easier to use than typical counters which, at 36 inches, may be too high to use. Look for a home with kitchen counters that are no higher than 34 inches, are 30 inches wide, and have plenty of legroom underneath. Countertops can be lowered, so this is a modification that could be made if you’re unable to find a home with accessible counter space. Bathrooms can be particularly troublesome for seniors, so look for houses with bathrooms that have plenty of safety features. Grab rails next to the toilet and in the bathtub or shower are important safety precautions, as is a walk-in or roll-in shower. Non-skid surfaces should be installed in front of the toilet and sink as well as in the shower or tub. As with doorways, many of these are modifications that can be made after you move in, though it’s important to do plenty of research when looking for the right contractor at the right price (preferably one with experience making senior-friendly upgrades). Websites like Barrier Free Home can help you find homes that have entry ramps, a necessity for seniors in wheelchairs or who need other mobility-assistive devices. A ramp is, of course, essential for a senior in a wheelchair, but can also be helpful for older adults with severe arthritis and back pain. If you’re interested in a home that has uneven transitions between rooms, you can overcome the problem by installing door threshold ramps. These create a level space for mobility-challenged individuals. Moving companies can be expensive. Finding the right one for your move may be difficult unless you do plenty of online research, comparing prices and services. Focus on companies that have experience moving seniors and understand their particular needs (some companies work with senior move managers, who can help make packing and moving go smoothly). Make a list of features you need and expect from a house before beginning your search, but don’t necessarily dismiss a property that doesn’t have all the features you want, because many safety modifications can be made affordably after you’ve moved in. If you have mobility restrictions, think in terms of safety as well as accessibility.